We have had several discussions on the Forum about the cooling system on the 351 and how it has two flow paths depending on if thermostat is open or closed. My 1973 Mustang vert has a 351 H code that the PO had put and Edelbrock performer 4-V to 2-V head and holley 4-V carb. on. He had let the car set for 25 years so when I got it I spent another year taking apart detailing and cleaning. I did not tear into the engine it started and ran and he said he had his pit crew put cam, MSD ignition on the do some other performance items. He was a winning sprint car driver in California. Well I have only driven the car maybe a little over 100 miles in last 11 months. Each time the temp would climb almost to the H on gauge and when you cut it off would blow coolant out. I have the correct Stant 192 deg. thermostat and the correct Ford baffle under it. I even changed to another big radiator I had that was spotless clean and still running too hot. I had seen this if the past in 289 302 engines that the person building the engine put the head gaskets on backwards. You can verify them through the core plug holes in the front of the head without pulling the head, no core plugs there on C engines. I had searched the net and ask on this and other forums if there was a way to check a 351 C and all said not you had to pull the heads. We all know that the gaskets are min. of $85 to well over $100 to do that. So this morning I decided to go into engineer mode. Went to the garage pulled out a bare 351 Q code block and I figured out a way to check if gasket is on correct on the passenger side but could not find a way on the drivers side. 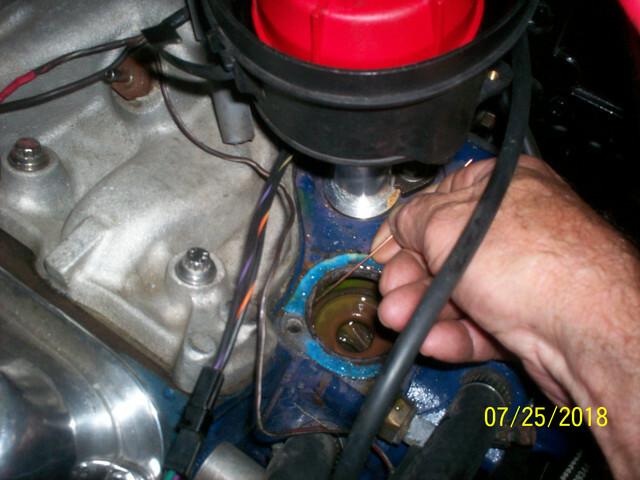 You pull the thermostat housing off and run a piece of metal coat hanger or weld rod down beside the baffle under the thermostat and go through the opening in the block and should go into the head if on correct, see pics. When I check the engine in the car the gasket was on backwards. 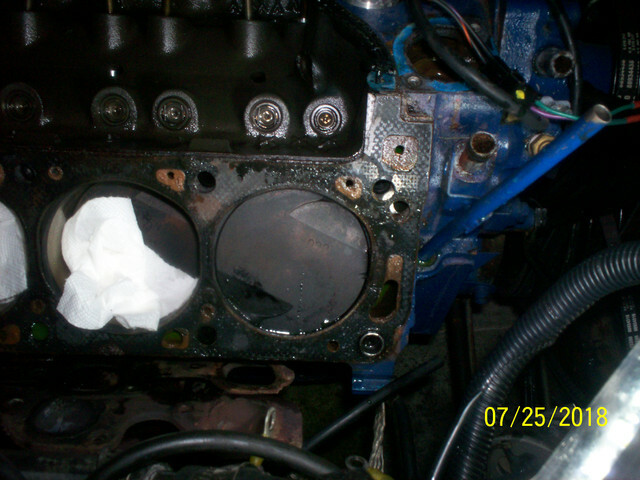 So I pulled the R.H. head and sure enough gasket backwards. That prevents the water from flowing from the rear to the front of the head except through some tiny holes. That is the reason it blows water out when you cut it off comes back through the water pump from percolation of the coolant. 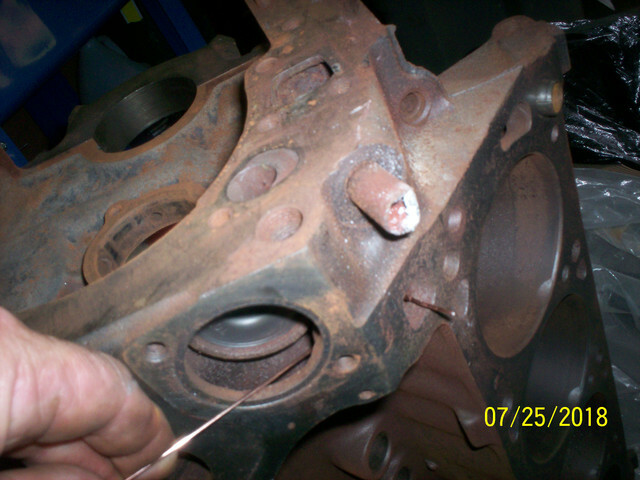 So I am off to get some gaskets and got to remove the other head also will not take the chance that both are not wrong. BTW since he races for a living and has experts for mechanics they can also do incorrect things. The gaskets will come stamped FRONT in big letters but people just do not look. I think he races Chevy engines so SBC does not have a front or back will go either way. 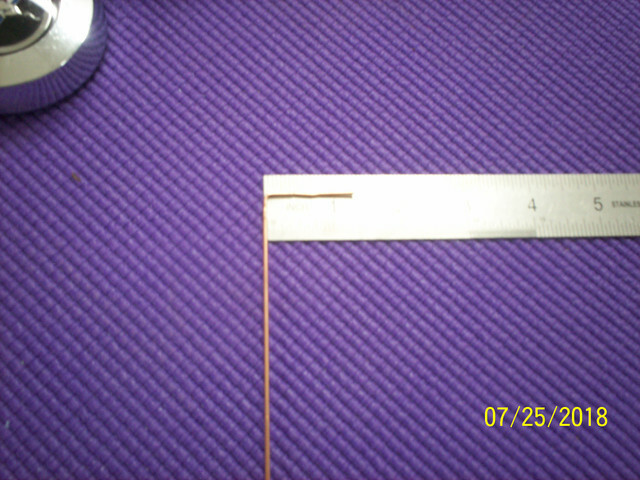 Here are some pictures of the wire in the bare block and on a scale if you want to make one. Also showing how I went into the engine in the car. 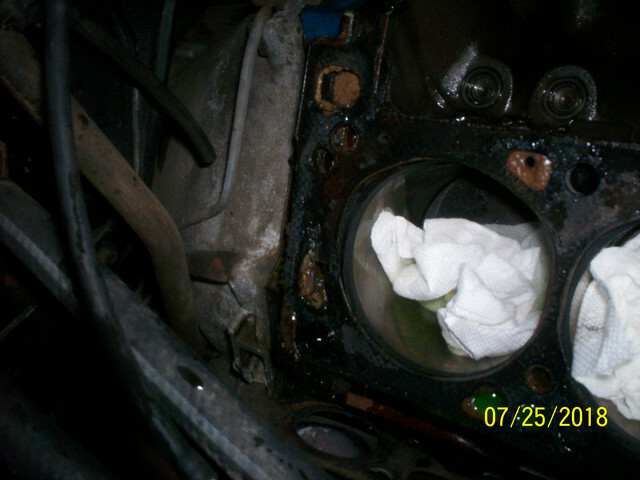 Pics of the gasket on the car and it was almost erodinghole where it needed one. When I get back together I will post results. I was at Dr. yesterday will be going for MRI and maybe spine surgery so taking the heads off is pure torture but I have to know. I did pretty good stated looking at 10:00 and had it apart at 12:30. Darn heads are heavy. The inside of the engine is very clean and still shows great hone marks on cylinders so I guess the 48,000 miles is correct for the car. that's a great bit of detective work. Good job figuring it out. I have two extra sets of head gaskets if interested. One from the Felpro kit and another from the Mr Gasket kit. 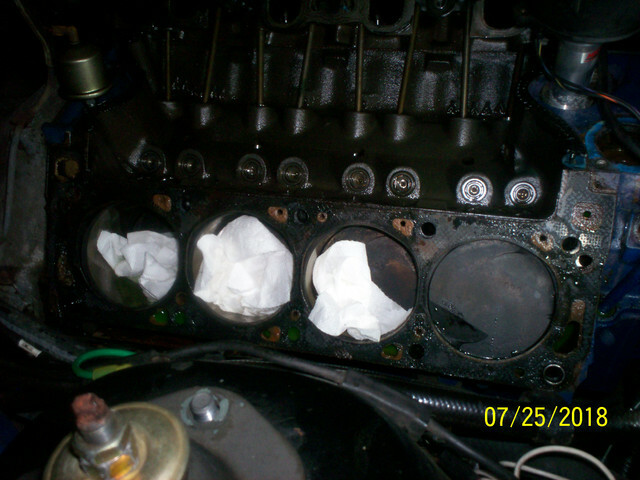 Why are the gaskets so expensive? You tell me on the gasket price. The racing gaskets are stupid expensive. I went to Auto zone and they will be here tomorrow for heads on Monday for intake. $68.00 for both for Fel Pro. Now another eye opener. I have heard and assume that .040" is what is considered the safe limit for a 351 overbore. I was in the garage cleaning the deck and this engine is .060" over. I will be shocked if it runs cool when put together correctly. I do not have access to ultrasonic thickness tester at this time but will see if I can borrow one tomorrow. I would be interested in the cylinder wall thickness. You would need a perfect cast block to go that far. 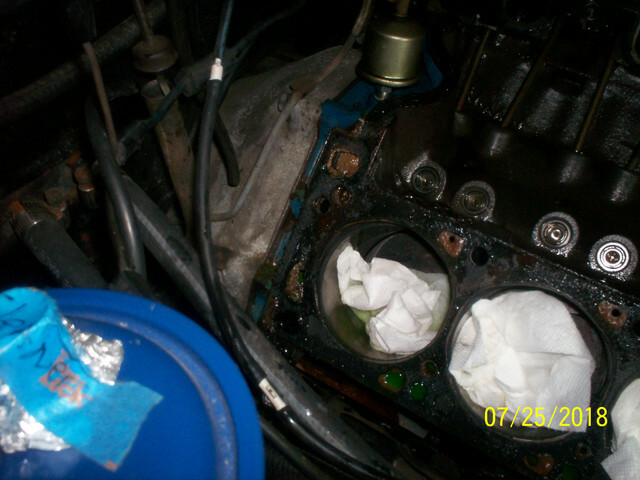 He changed the valves not Ford and has the good valve stem seals not the hats so some work was done better. I have 14 mixed drinks to get through the pain today, lol. That with muscle relaxers makes you superman. Only way I can take the pain to do this maybe one last job. 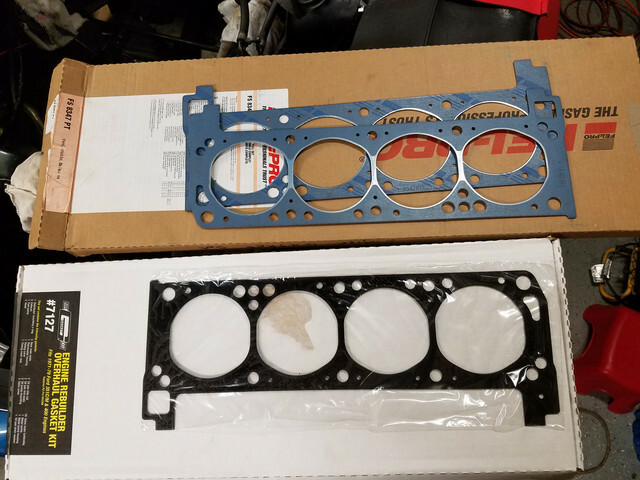 The head gaskets cost almost the same as the whole set. (07-25-2018, 09:07 PM)tony-muscle Wrote: The head gaskets cost almost the same as the whole set. $20 plus shipping. I guesstimate that shipping via UPS will be about $12 or so. If you need an exhaust gasket I have an extra one from the kit as well that I can throw in. Edit: I have to resend the post from my desktop since the new Tapatalk app wants you to login to share pictures. (07-25-2018, 07:35 PM)Carolina_Mountain_Mustangs Wrote: You tell me on the gasket price. The racing gaskets are stupid expensive. I went to Auto zone and they will be here tomorrow for heads on Monday for intake. $68.00 for both for Fel Pro. 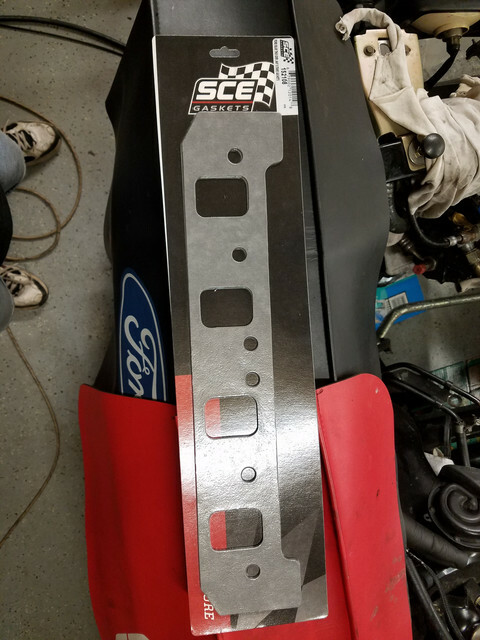 I also have a SCE 152108 intake gasket for Blue Thunder 2V. I bought it by mistake. I will throw that one in for an additional $10 if you are interested. I had custom MLS head gaskets made for my Cleveland and they ran me around $200 for the set if I remember correctly. But supposedly they can be reused.